I find it interesting that over time just about everything in the wine business gets better. Even the really inexpensive wines that I drank because that was all I could afford when I was much younger have gotten better. 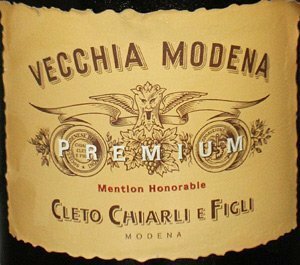 A great example is the Cleto Chiarli Lambrusco Premium Vecchia Modena ($14-16). This colorful sparkler is the kind of wine we would pick up when we wanted to appear a little sophisticated at a party. It tasted great and went down easy. It was like a European Ripple. But the next day our heads would be aching. It tasted a little too sweet and a little too alcoholic to be fine wine. To me, Lambrusco always equaled headache. The Cleto Chiarli (klahy-TOH key-ARHL-lee) is a gorgeous deep pink, almost red, in the glass with pleasant intense floral and strawberry aromas. The first sip reveals lively cherry and raspberry flavors. It is a dry wine, but there is no bite to it. In fact, as you drink it, it starts to taste a little sweet, which may be why it goes so well with Asian food. It is soft, almost creamy, on the palate, with just a hint of minerals on the finish. It is a terrific food wine, because while there are wonderful flavors in the wine, they don’t fight the food flavors. Everything seems to blend perfectly. This is an especially nice wine in the warm summer months. 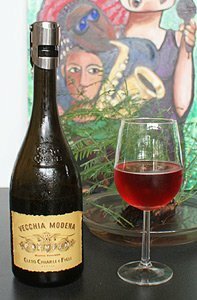 The grapes are Lambrusco di Sorbara. After harvest they undergo slight maceration, drawing off juice and then refrigeration. The wine undergoes slow fermentation. It also goes through prise de mousse, which is the second fermentation that produces the bubbles. Cleto Chiarli uses the cuve close method of developing the bubbles in a closed pressure tank, sometimes called the Charmat method. This wine has some history. It won the prestigious Mention Honorable prize at the Paris Universal Exposition in 1900. The modern version even has a close reproduction of the original bottle and label. It has become a true icon of Sorbara Lambrusco, winning the 2010, 2012 and 2015 Tre Bicchieri prizes from Gambero Rosso. You might have difficulty uncorking this wine, because it doesn’t have the usual wire cage around the cork. Instead it has a metal band across the top that latches onto a metal ring. The easiest way to open it is to pry out one end of the band, pushing it away from the bottle. Then you just twist the cork as with any sparkling wine. Or if you want to do it according to tradition, you hold the cork and twist the bottle. Lambrusco comes in a range of sweetness levels, from driest to sweetest: secco, amabile, dolce. Sometimes that is not on the label, but dry seems to be the default mode these days. Lambrusco is a family of three of four grapes that produce high quality wines. Unlike the 1970s, when Lambrusco topped the list of U.S. wine imports, the wines now are made in small batches, with care taken to quality. The wines are called frizzante, which is less bubbly than most sparkling wines. Actually the Lambrusco of the 1960s and 1970s was marketed to younger people who weren’t sure if they liked wine. One of the slogans was “Riunite on ice, it’s nice.” It was like some kind of cocktail with less alcohol. Winery: Cleto Chiarli founded his eponymous winery in 1860, after he had success with his homemade Lambrusco served exclusively in “Osteria dell’Artigliere”, his restaurant in Modena. Chiarli is the oldest producer of wines from the Emilia-Romagna region in northern Italy. Lambrusco’s history has been closely linked to that of the Chiarli family for many years. The winery is a nice mix of history and tradition and modern practices. In 2001 Mauro and Anselmo Chiarli, Cleto’s great-grandsons and current leaders of the company, decided to build a new winery under the founder’s name, Cleto Chiarli. Using state of the art equipment the Chiarlis rely on nearly 160 years of tradition to make world class wines. The grapes come from 324 acres of family-owned vineyards scattered throughout the Modena Province. Their land holdings total more than 1,000 acres. Cleto Chiarli never got caught up in the Lambrusco craze that swept cheap, mass-produced Lambrusco across the United States. They kept making their high-quality wine that could be the spark for a new Lambrusco invasion. In addition to several Lambruscos, Cleto Chiarli produces brut rosé made from Grasparossa and pinot nero and a blanc de blancs from pignoletto and chardonnay. Recently the company has been certified V.I.V.A., an important distinction linked to the Sustainable Viticulture Program promoted by the Italian Ministry for Global Sustainability. 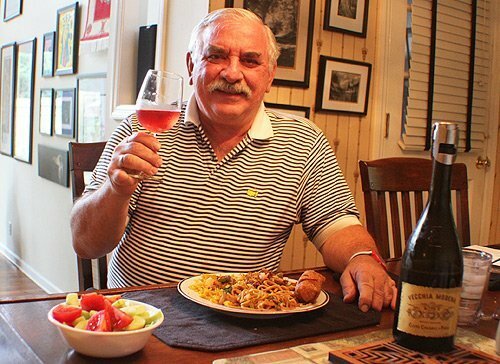 The Cleto Chiarrli Lambrusco was a great match for Chinese carryout. Goes with: We had this fun wine with Chinese takeout. It’s often difficult to find a wine to pair with Asian food, but the Cieto Chiarli Lambrusco was perfect. It’s fruity and not too sweet, and the bubbles make everything fresh in your mouth. Asian food, such as our Chinese take out, has a variety of flavors and often some hot spices, so traditional dry wines have a tough time matching up. It was a hot day and I didn’t feel like cooking, so we picked up some food from China, our favorite Chinese take out place on Washington Road, next to Publix. I got Kung Po chicken, chicken fried rice, chicken lo mein and an egg roll. My son Michael got Hunan Chicken and his girlfriend Micheala ordered sesame chicken. Teri was out. Some of those dishes were spicy, but it didn’t affect the wine. The Lambrusco tastes like it was made for this food. Lambrusco is great with many kinds of food, especially food you might find in northern Italy, such as salami, pasta and tortellini. I also would serve it with pizza, hamburgers, hot dogs and just about anything on the grill.